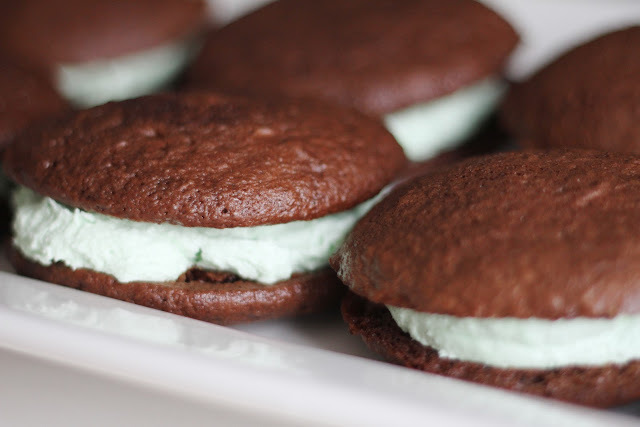 In honor of St. Patricks Day, I decided to make mint chocolate chip ice cream whoopie pies. The only problem? The mint chocolate chip ice cream was completely gone before I had a chance to take pictures in good lighting! So I will be posting that recipe real soon! I had a few of the cakes/cookies leftover the next day, so keeping with the green theme, I made a light and creamy mint filling to layer between the cakes. They were a hit! And so incredibly fast and easy because the cakes are made from a box cake mix! Mix together and drop by teaspoonfuls on greased or parchment lined cookie sheets. 400 degrees for 7-8 minutes. They will spread and rise a lot while baking. I was able to get roughly 30 individual cakes which equals 15 whoopie pies at 5-6 inches in diameter. Allow to cool on racks completely. Then store in airtight containers until ready to use. 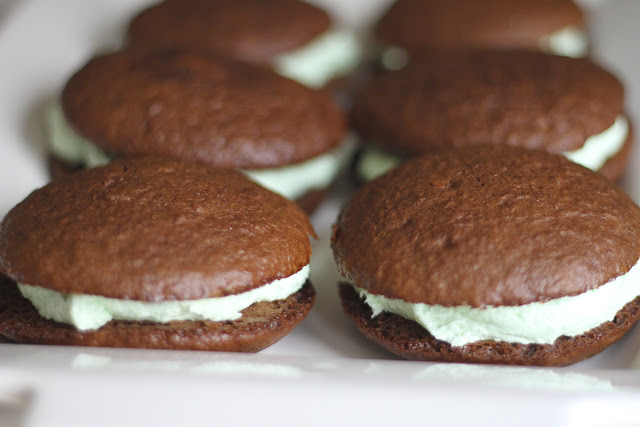 Assemble the whoopie pies by putting a generous amount of filling between two cakes. Cover tightly at room temp until ready to eat! love mint and chocolate together. These look good, sister! Curious about the crisco in the filling. Does it make it fluffier? Love you. Yeah, you had me at mint and chocolate. Yum.